Description: Nothing attracts a crowd like the smell of freshly popped popcorn. That authentic smell and flavor will have people lined up for a bag. 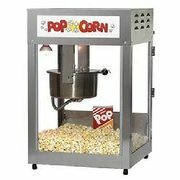 This popcorn machine makes 12oz to 14oz of popcorn every 3.5 minutes for 120-160 1 oz servings of popcorn an hour. We include an aluminum scoop for easy serving.